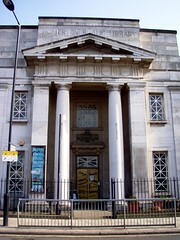 A cultural centre for Homerton. It hosts various events, e.g. a blues night and a monthly cabaret. It was famous for its Christmas shows in the 1980s. Last edited 2013-03-10 10:43:12 (version 7; diff). List all versions. Page last edited 2013-03-10 10:43:12 (version 7).